Local 965 of the American Federation of State, County and Municipal Employees is holding a rally noon-1 p.m. Saturday, April 7, on the plaza outside Fayetteville Town Center — map/directions — for the U of A Living Wage Campaign. It will feature several top speakers. A significant segment of university employees are paid less than commonly accepted living wages. Also, graduate teaching and research assistants though generally part time rely heavily on their pay, which is substandard. One proof is the campus’s 7-year-old Jane B. Gearhart Full Circle Food Pantry. College pay is the focus of a petition. It will be submitted to top officials of this campus and the UA System. Mike Pierce (from left), Ted Swedenburg, Kelly Hammond, Bret Schulte and Steve Boss manage the Local 965 information table Jan. 20 at the Fayetteville Women’s March 2018, at the downtown square. Bret Schulte (from left), Ben Pollock and Kelly Hammond take a breather while running the Local 965 information table Jan. 20 at the Fayetteville Women’s March 2018, at the downtown square. Local 965 members Steve Boss and Bret Schulte at the Fayetteville Women’s March 2018 on Jan. 20. 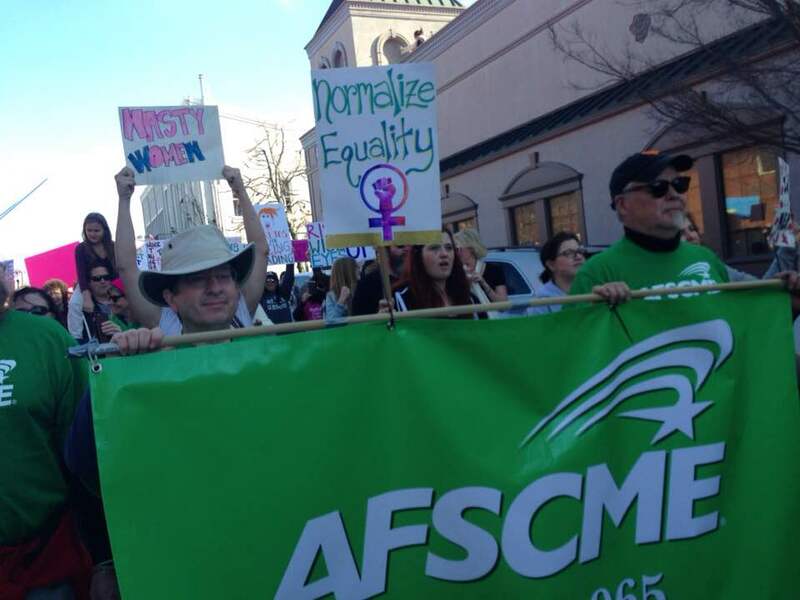 AFSCME members Ben Pollock (left) and Ted Swedenburg parade the Local 965 banner Jan. 20 at the Fayetteville Women’s March 2018. Member Steve boss’s shoulder is at far left. Members of Local 965, American Federation of State, County and Municipal Employees participated in the Fayetteville Women’s March 2018 on Jan. 20. A rally began the program at noon outside the Fayetteville Town Center. Local blues singer Ocie Fisher serenaded the crowd that easily surpassed 1,000 women, men, a number of children and a few pets. Rally organizers estimated 3,000 people attended. Speakers included area politicians such as 965 member Mayor Lioneld Jordan, and prominent activists such as 965 member Law School Professor Cyndia Nance, Mohja Kahf, Blanca Estevez, Evelyn Rios Stafford, Raven Cook and Caitlin Wood. The march portion of the program began about 1:30. 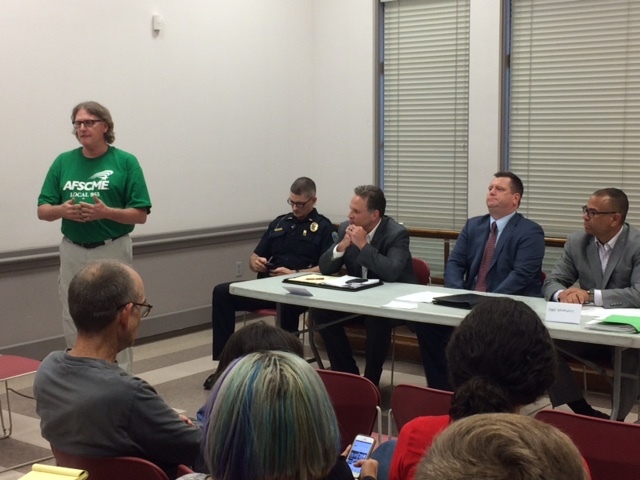 While originally set to head a few blocks north to the Washington County Courthouse on sidewalks alongside College Avenue (U.S. 71 Business), rally leaders accepted civil authorities’ request to travel a similar distance east along Mountain Street ending at the Fayetteville Public Library. 965 members President Betty Martin, Steve Boss, Mike Pierce, Bret Schulte, Ted Swedenburg, Kelly Hammond and Ben Pollock ran the information table and later held its 6×3-foot bright green banner through the march. Here are news reports of the event. Updates will be noted. 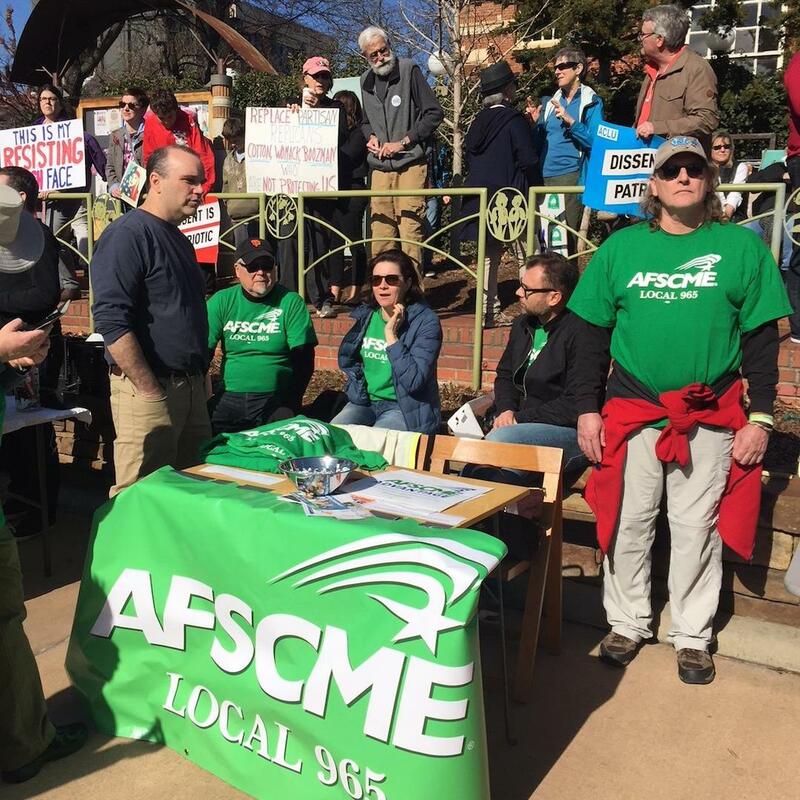 Mike Pierce and Tricia Starks represent AFSCME Local 965 at Fayetteville’s Martin Luther King Jr. march Jan. 15, 2018. 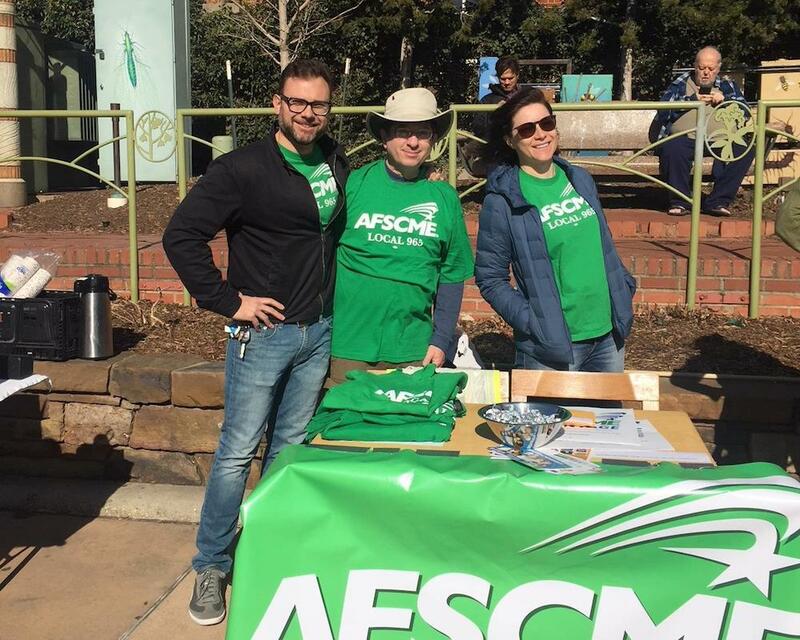 Mike Pierce (left) and Ted Swedenburg represent AFSCME Local 965 at Fayetteville’s Martin Luther King Jr. march Jan. 15, 2018. 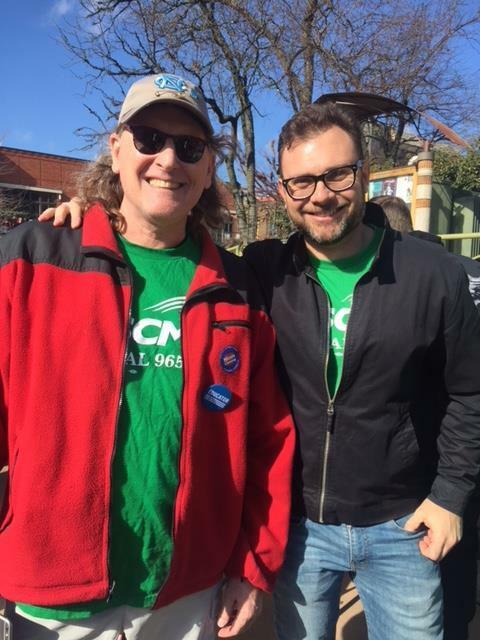 AFSCME 965 members Ted Swedenburg and Mike Pierce represent the local in Fayetteville’s 2018 Martin Luther King, Jr. Freedom March. About 400 people braved the cold to commemorate the life of King, the pastor and civil rights leader who was assassinated while leading an AFSCME sanitation workers strike in Memphis in 1968. The local program was organized by the Northwest Arkansas Dr. Martin Luther King Jr. Council. The march moved along Razorback Road from Martin Luther King Boulevard to the University of Arkansas Union. A vigil with speeches and a performance by the Inspirational Chorale followed in the union. The day ended with the council’s 22nd annual MLK Recommitment Banquet at the Fayetteville Town Center. Professor Steve K. Boss of the University of Arkansas Department of Geosciences leads an Aug. 15, 2017, panel on the state’s new law allowing guns on campus. The session was held at St. Paul’s Episcopal Church in Fayetteville. 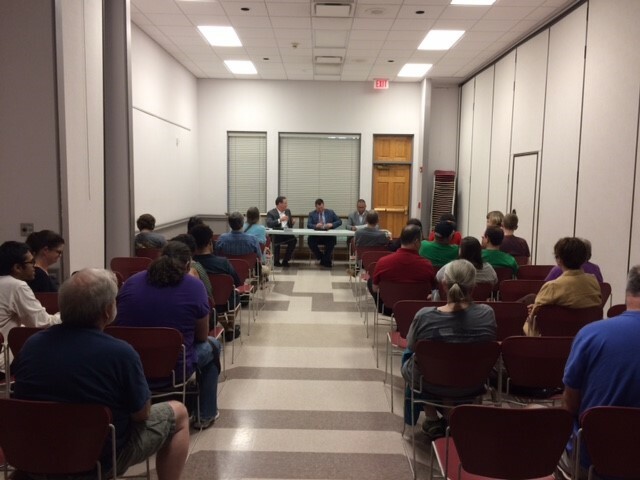 Local 965 of the American Federation of State, County and Municipal Employees hosted a forum Aug. 15, 2017, on Arkansas new law allowing concealed weapons to be carried on campuses statewide. Panelists included Mark Rushing, assistant vice chancellor of University Relations of the University of Arkansas, UA Police Chief Steve Gahagans, UA Associate General Counsel Matt McCoy and Fayetteville police officer Scott Carlton of the Fayetteville Police Department. The session was held at St. Paul’s Episcopal Church in Fayetteville. 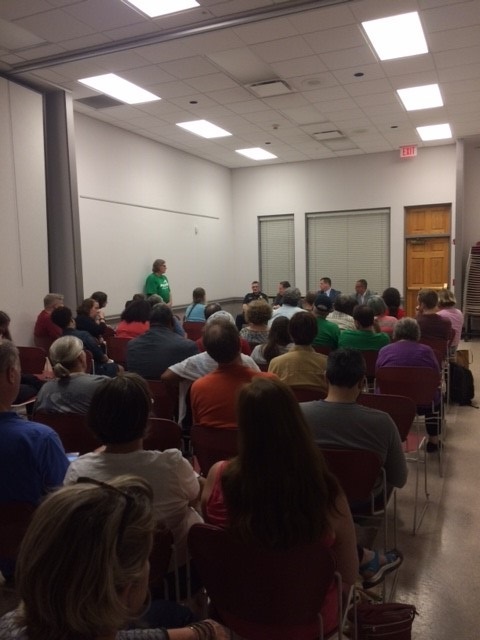 More than 50 people attended the Aug. 15, 2017, panel discussion on Arkansas’ new law allowing concealed weapons to be carried on campuses statewide. The session was held at St. Paul’s Episcopal Church in Fayetteville and featured officials of the University of Arkansas. About 55 people, including UA professors and officials, attended an information session Aug. 15 at St. Paul’s Episcopal Church in Fayetteville regarding Act 562, the law that requires Arkansas public colleges to allow people to carry concealed handguns, said Steve Boss, the American Federation of State, County and Municipal Employees member and UA geoscience professor.